The late Rafael Frühbeck de Burgos, at some point in his long career, had conducted many of the world’s great orchestras. In 2011, the Spanish maestro received his final professional appointment as principal conductor of the Danish National Symphony Orchestra and one that he held until 2014 when he retired due to poor health. 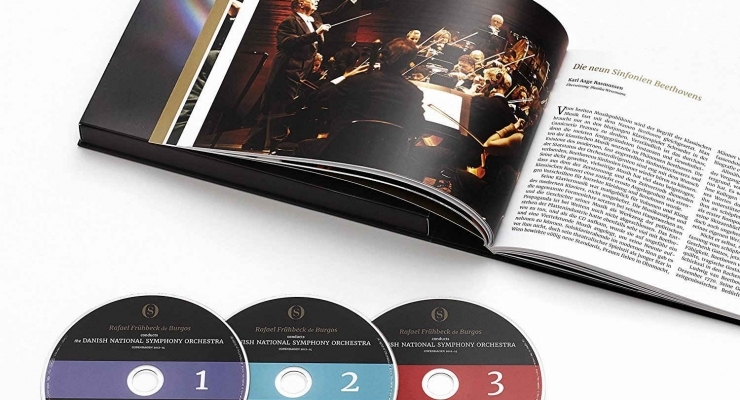 The performances in this three Blu-ray disc set were recorded between 2012 and 2014 in the DNSO’s spectacular new 2009 home, the Copenhagen Concert Hall. The program is quite generous, including the complete Beethoven symphonic cycle and, as supplements, Hector Berlioz’s Symphonie Fantastique, Joaquin Rodrigo’s Concierto de Aranjuez, and Richard Strauss’s Ein Alpensinfonie. This is repertory that Frühbeck de Burgos frequently conducted and occasionally recorded and include works with which he had considerable affinity, as evidenced by his frequently closed eyes and absence of printed score. Distinguishing features of any Frühbeck de Burgos performance are his attention to dynamics, detail, and, most importantly, pacing. Nearly every major 20th century conductor has, at some time in his or her career, attempted to scale the heights of the first symphonic cycle of the 19th century that changed this musical genre forever. Rather than listening to these nine works in chronological order, I began with Symphony No. 3 “Eroica,” generally accepted as the first Romantic period symphony and one that broke with the classical style espoused by Beethoven’s predecessors, Mozart and Haydn. The innovation expressed in this work begins almost immediately with unexpected changes in rhythm, an extended first movement repeat, and deliberate dissonant chords. Innovation carries through the “Funeral March” second movement, and concludes with a brisk set of variations on a theme previously used in Beethoven’s ballet, The Creatures of Prometheus. What drives this performance, whether he is sitting (some of the time) or standing, is this conductor’s unerring handling of the shifting rhythms and elucidation of the inner orchestral voices. The cycle concludes with a towering “Choral” Symphony (No. 9) that features a strong lineup of vocal soloists, soprano Albina Shagimuratova, mezzo-soprano Charlotte Hellekant, tenor Scott MacAllister, and bass Johan Reuter, backed by the Danish National Concert Choir. Frühbeck de Burgos gets his forces to successfully storm the musical heavens that Beethoven always aspired to reach. The remaining seven symphonies all get their due as the maestro reaches deeply into each one and enables Beethoven’s unique creative “voice” to sing. This high-definition film has generally crisp details and superb colors. As might be expected there are occasional motion artifacts. Director Arne J. Rasmussen’s film crew gives viewers a wide variety of camera angles that are most engaging. The Danes have given us modern furniture and, in this case, a very modern and acoustically terrific orchestra hall. The dts-HD MA soundtrack contributes plenty of hall ambience and presents a warm account of the music without missing important instrumental details. Concierto de Aranjuez is the ultimate Spanish guitar concerto and composer Joaquin Rodrigo’s best-known work and its familiar romantic Adagio has found its way into nearly all genres of music. Spanish guitar icon Pepe Romero delivers a masterful reading with superb support from Frühbeck de Burgos and his Danish forces. Symphonie Fantastique is composer Hector Berlioz’s paean to drugs with each of the five movements a different tableau that concludes with a thrilling Witches’ Sabbath. This is trail-blazing “program” music and an orchestral spectacular that showcases the virtuoso players in the ensemble. The maestro avoids this symphony’s bombastic pitfalls and delivers a tasteful yet very exciting rendition. Eine Alpensinfonie is not one of Richard Strauss’s most inspired “tone poems” with twenty-two scenes that describe an “exciting” day in the Swiss Alps. Frühbeck de Burgos gets his Danish players to transform this piece of musical kitsch into something far better than it really is, leaving listeners mesmerized at the final “Nacht” scene. The program booklet embedded in the presentation box is gorgeous and includes fine background essays on the conductor and the works included in the program. The usual track listings and performance and production credits as well as performance photos are also provided. 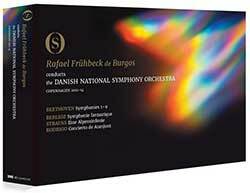 I knew Rafael Frühbeck de Burgos mostly from his Spanish repertory, and found this box set to be the perfect after-Christmas gift that I did not get on December 25th. It is a rare opportunity to see a master at work, tackling a huge and varied program that would be daunting to many of today’s younger conductors. Consider this release a testimonial to one of the greats of the musical world and one to treasure and share with your family and friends. Highest recommendation. Legendary conductor Rafael Frühbeck de Burgos gets a spectacular send off in this generous collection of Beethoven symphonies and three additional orchestral masterpieces.